96 Brookside Avenue - Ira M. Emanuel, P.C. After purchasing an investment property from the foreclosing lender, the investors learned that the property's status as a non-conforming three-family house had been lost due to cessation of use. 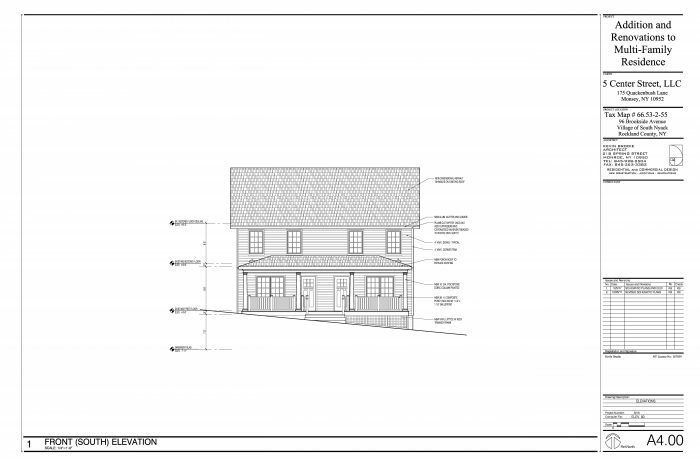 The Village of South Nyack required an amended site plan and variances as a pre-condition to renovation work, even though the building was not going to be enlarged or moved. Although we unsuccessfully argued against these requirements, we obtained site plan approval, conditioned on obtaining relief from the ZBA. At the ZBA level, we argued that variances were not needed and, alternatively, that if they were needed they should be granted. The Planning Board, when granting site plan approval, recommended the granting of the area variances, but expressed concern over the parking variances because of the tight parking situation in the area. Ultimately, although skeptical of the need for variances, the ZBA denied our argument that variances were not needed, and granted all the requested variances in our alternative argument.